Imagine my delight when I discovered that Dr. Campbell-McBride had decreed that cocoa powder was OK for us advanced GAPSters. Then imagine my sadness when I discovered that there were zero decent almond flour brownie recipes out there on the internet. Of course I had to fill the void. Some things are worth a little trial and error! I believe I have finally got it right. These babies could definitely give the old gluten-laden variety a run for their money. I made these today, and there is one left (only because I don't think anyone else realizes it!). These make a dense, moist, chewy, chocolaty brownie. Heat oven to 350 degrees F. Mix honey, butter, vanilla and eggs until smooth. (If omitting baking soda, beat eggs until foamy before adding in other wet ingredients.) Add almond flour, cocoa, baking soda and optional salt. Stir to blend. Pour into greased 8x8x2 inch pan. Bake for approximately 25 minutes, until center no longer jiggles and top feels cakey. Cool on a wire rack at least until sides pull away from the edge of the pan before cutting. Thanks! excited to give them a go! I made these tonight w/some variations: halved honey w/ maple syrup. added a fourth cup of coconut flour. halved butter w/ coconut oil (cuz i like flavor of butter but want a vegi based fat more). dashed in a pinch of cinnamon. they were not a 'chewy' brownie, but WAY WORTH IT. thank you so much for posting this! Teri, these look really good. I remember the flourless chocolate cake you made many Thanksgivings ago that was amazing! I made these brownies and they are exactly what I have been looking for. Dense, chewy, and they hold together. Finally, a grain free brownie that is fabulous! Stayc, thanks for sharing your modifications with us. Many people will want to try coconut flour and oil. Mary, we have so many fun, food-filled memories with you! I am working on a version of that same cake that I can post here. It's so dense and rich that you can't make it frequently. My first attempt was not a disaster, but not great either. We are going to have to go off chocolate for a bit, as we seem to be reacting to it. Hopefully by Valentine's day, we'll be able to tolerate it again. BTW, if you bake this same recipe in muffin cups, you get beautiful individual cakes that could be dressed up with raspberry puree and whipped cream (or sour cream) or homemade ice cream. I haven't tried them cooked because they are currently in the oven right now, but the batter is amazing and better than anything else I've ever tried grain free! Thanks so much! i've now eaten more than my fair share...soooo very good!!!!! thank you so much!!! i might be a little obsessed with brownies and chocolate...so really, it's so nice to have a great brownie recipe finally! I hear you on the obsession thing :) Glad you enjoyed these though. Made these today, very happy with them! I made a couple of modifications - I used agave nectar instead of honey, olive oil instead of butter, and I added cherries to it. Also, the mix was far too wet (perhaps because I used large eggs), so I added about an extra 1/2 cup of almond flour. But they came out soooo good, and really scratched the chocolate itch!! Excellent. Thank you for sharing your modifications with us. Agave nectar is really bad. It has more fructose than HFCS. Better stick to Sucranat. I thought so too until I read further than Dr. Mercola. Check out www.Xagave.com and read the respectful & fact filled response to his bash on Agave nectar. It clarified lots of misconceptions and helped me alot. Mercola is a quack, but fructose is still harder on your liver than sucrose or glucose, which is why HFCS is terrible for you, and so are some fruits (oranges). Honey is not necessarily better for you than raw cane sugar (though raw honey has medicinal properties, they are pretty much destroyed when baked). Xagave is made differently, but I have learned through experience with sweeteners and purportedly low glycemic/low carb/low sugar products not to trust labels too much (when you have a blood glucose monitor, it's pretty easy to figure out what's going on). Heck, I eat regular old refined sugar sometimes, I don't mind what you put in your brownies. But agave isn't health food. I'm sure that was delicious too. Yummmm. Used 2 cups of Honey instead of 2/3 as read recipe as 2-3! The recipe calls for 2 1/3 cups of honey. Not 2 or 3 cups of honey. Just made these and we love them! I thought they were very light with a melt-in-your-mouth type texture. Next time I'll double the recipe and put them in a 9x13 pan. I think they'd be wonderful with ice cream and hot fudge on top or chocolate chips mixed in the batter because they aren't all that sweet (definitely sweet enough for myself, my husband and my nearly 3-year old son, but maybe not quite sweet enough for sharing on their own with friends/family that are used to the processed box mixes). We love them on their own too though (so far we've only tried them warm since they're still cooling). Thanks for the great recipe, we will make these again and again for sure! I'm glad you enjoyed them. So far all of our non-GAPS friends have been fine with the level of sweetness, maybe because people have gotten so used to bittersweet chocolate? I've made these a few times now and we really like them. I doubled it in a 9x13 and thought they were a LITTLE thick for eating without a fork...so below is my conversion of 1.88 of the recipe to give a not too thick, not too thin brownie in a 9x13. I noticed that if you bake for 25 min, they're more cakey. Less (like 21-23 min), they're more brownie like. So, I think this would be a great recipe for some upcoming birthday cakes and I can just underbake them if I want a fudgier brownie. Thank you for the recipe! You might try using another egg to help them bind together better. These are definitely more crumbly than traditional gluten brownies, but they hold together pretty well for us here at sea level. Another option, if you're not on GAPS, is to try adding a pinch of xanthan gum at the end of the mixing process. Xanthan gum is not allowed on GAPS though. Also you may try using a tablespoon of flax meal mixed with 3 tablespoons of water... this is equivalent to 1 egg... this may be better for you than adding an extra egg... good luck! I plan on making some of these myself .... they sound scrumptious!!!! These are AMAZING!!! They are definitely better when completely cooled, they are delicious chilled, very rich and moist. I am really going to have to try to get some of these chilled :) Thanks for the suggestion. I did not have much luck this time, Will try again soon!! If you let me know what your end results were like, I might be able to help troubleshoot. I love to bake and I love chocolate. These are simple, packed full of amazing ingredients and so good. We used almond meal because it's all I had on hand so it turned out to be the most moist Delicious chocolate cake! Then I mixed up a cream cheese cacao icing and topped off the cake. Amazing! Keep up the great work! We are so addicted to these! Everyone we've served them too has also loved them. My 7 year old nephew who refuses to eat anything with nuts other than peanuts (or anything with healthy ingredients actually) and lives off of processed food even loves these and has no idea that they're not the usual box mixed brownies he's used to. I now cut down on the amount of vanilla because it was creating too strong of a flavor for our tastes (I just use 1 t now), but other than that the recipe is perfect and so easy! The person above is right - they are better when completely cooled, but still tasty warm. Sometimes when I'm making these to take to a party, I'll also add a few dark chocolate chips for an extra chocolate punch. I'm going to try them next with a cheesecake swirl to see how that works - can't wait to find out! Excellent! Let us know how the cheesecake swirl turned out. I have also been using less vanilla, just to save it. I got in the habit of using a lot with coconut flour, which seems to mask flavors. I don't mind a strong vanilla taste, but it's not necessary in these. You could certainly use olive oil in this recipe, but the flavor would be a bit stronger. Many Italians love olive oil in baked goods, so I think you should try it. If you do, let us know what you think! thank you so much for this recipe! I had previously tried some GAPS friendly coconut flour brownies and although my family loved them, I was so disappointed, they were just not for me. Brownies are the only thing I have craved since starting GAPS 4 months ago, so it was great to find this recipe. They aren't exactly the perfection I had remembered, but they are so much closer than I expected/than anything else I have tried, hooray!! The flavor is really good, and the texture is almost perfect. I am sure I will be making these again. I am so glad you are enjoying these! Can you substitute Stevia for the honey? If so, what would be the ratio? Hello! I had a few ingredients to use up, which is how I found your blog post. Never made brownies before -- and not much of a baker, generally -- but these turned out perfectly! Not too sweet, moist and fluffy. I used a mixture of butter and olive oil. As it is, we've eaten two and I have six more -- I used muffin tins. A friend is coming over later and I'll serve these with a bit of icing sugar dusted on top -- and served with a glass of red wine. Thanks so much for posting up this recipe!! I am doing something similar to GAPS- anti-fungal yeast free. I use Stevia a lot as it doesn't bother me and is allowed on the yeast free diet. I can not have any grains so I use almond meal quite a bit! I can not use honey and I have found that about 1/2 cup of honey is equal to about 1 tsp of Stevia in the concentrated powered form. ( I use either the Whole Foods brand or Trader Joes). I will try this recipe using the substitutions and will most likely add unsweetened applesauce or a little more butter or oil. I tried these today and they were a big hit my my brownie-loving family. They are very picky about their brownies and I was so shocked I had to break my diet to try one. It was definately worth it. Thank you for posting it. Just made these, and eating them right now...awesome! Made these tonight with a little less honey and some stevia, they were chewy and amazing, my kids loved them too. Just wanted to add, I made them today and added some peppermint extract...AMAZING! I am going to try them on Sunday for my birthday and double the recipe. I am going to make some substitutes. Agar, goat milk butter, carob powder, & omitting baking soda and salt. I usually use xylitol in place of sugar, but not sure how to do with this recipe. I have a great recipe for brownies, but have not made them for so long because it calls for maple syrup and brown rice syrup. I made these on Tuesday and they were devoured! My fiancee LOVED these! Since we've gone grain free I've been constantly searching for great recipes that still taste like normal... this one is a keeper! Thank you SO MUCH! This recipe is a keeper. So they might not be as chewy or fudge-y as traditional brownies (although I have yet to see what they're like once chilled), but let's face it- they are pretty damn successful for being GAPS. I am personally a fan of bittersweet chocolate so I like the taste, and the combination with coconut is simply heavenly. I will definitely be making these again. Thanks for sharing! These are AWESOME! Thank you for sharing! These were amazeballs! More cake like than fudge like, but delicious nonetheless. I used 1/3 cup of succanat and a few tbs of raw honey because the latter is so expensive. It had the right amount of sweetness. I did also reduce the vanilla extract to 1 tsp. Thank you! Can you please point me in the direction of where you saw that cocoa was GAPs legal for late-stagers? I am teaching some friends about GAPs and want to make sure I am giving them the right info. Everywhere I've looked so far says cocoa is off limits. Dr. Campbell-McBride addresses the issue of cocoa in her frequently asked questions, here: http://www.gaps.me/preview/?page_id=32. I hope that helps. 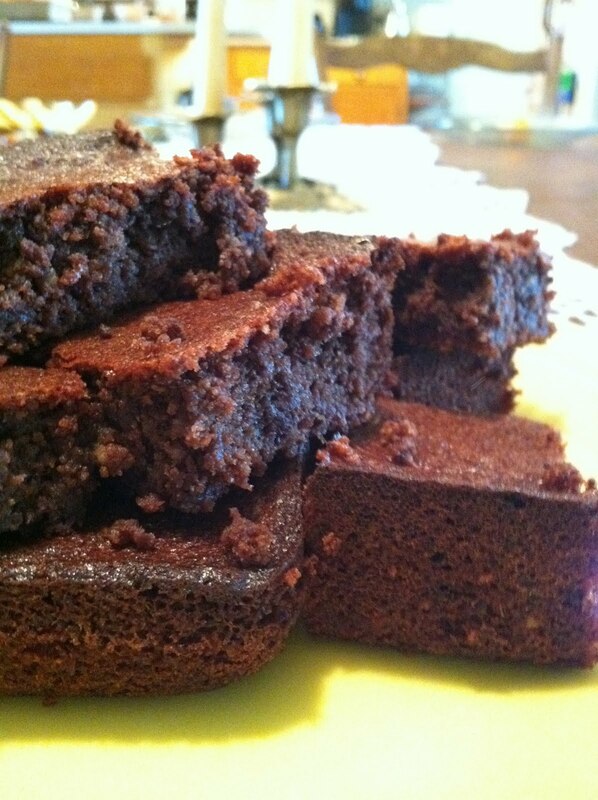 One could also use these brownies while transitioning from a standard diet to the GAPS diet. Many people like to start on "full GAPS" before working their way to the "intro diet". This recipe is also great for "Nourishing Traditions" folks and those who would just like a more nutrient-dense treat. I believe that these are far more nutritious than a commercial granola bar, for instance. These brownies are fantastic. Thanks for sharing the recipe. I am on my second week of being wheat free. I'm still figuring out different ways to use almond flour. These brownies are so delicious! I'm so happy to have a treat I can eat and also know my kids will enjoy it (and it is much healthier for them). I'm serving these up as dessert for Plam Sunday lunch. I just want to say these are amazing! They are my go to when I need a treat and everyone grain free or otherwise loves them. Thank you so so much! For a sugar free variety, here's how we altered the recipe. First off, we doubled it to make it fit a 9x13 pan. Second, we omitted the honey. Third, we added 2/3 c coconut milk, 4 T stevia and 2 T xylitol. As I said, all other ingredients were doubled. They did have to cook a little longer but turned out fabulous! I made these with 1/2 cup coconut oil and 1/2 cup honey. The taste is very good, but I find the cake is a bit oily. Since butter is not all fat, perhaps that would be better for us. I used half butter, 1/3 c. coconut oil, and the rest olive oil. I also combined honey and maple syrup. It came out great. Thanks for the recipe. I love using the almond meal rather than whole wheat flour. It adds better nutrition. I used yacon syrup and a little stevia/inulin powder mixture and they are awesome!Thank you for this recipe! This is an amazing recipe! I left out baking soda/ powder, used coconut oil instead of butter (and added a little extra), and got dense fudgy brownies. This is my new go to recipe! Thanks for sharing. The best brownies I've ever made! Thank you. I used almond flakes for toppings. Is there an ingredient to use instead of butter or any oil? I'm afraid I wouldn't know how to bake without any oil :-) In general, I think that the right kinds of fats are very nutritious and necessary for good health, but I recognize that we are all on different journeys and that there are specific (and relatively rare) health concerns that might necessitate a low fat diet. I have heard of people using applesauce or apple butter in place of fats in their recipes, but I don't have any direct experience with it. Best of luck to you! I didn't have any honey so I used 1 cup erythritol instead and added an egg to counteract for the extra dry ingredient. Easiest, most delicious low carb recipe I've tried thus far!! Amazing. I made these tonight for my family with very high hopes after reading the comments. I followed the exact recipe, but sadly they were very cakey and oily:( The recipe is so healthy though! Is there any way I could fix it next time? I'm sorry they didn't turn out for you. When you say you followed the recipe exactly, do you mean you used raw cacao? Did you use butter or coconut oil? Also the variety of almond flour could make a difference. I use Honeyville blanched almond flour. Many brands use the skins in their almond flour/meal, and this could definitely contribute to a more oily texture. Humidity can also play a role. Next time, try slightly decreasing your oil. If you want a fudgier brownie, cook for a slightly shorter time. These taste even better the next day. Best of luck and let me know how your next batch turns out. Hi there! I am on a low carb lifestyle and would like to substitute the honey with something else. I wonder how much Xylitol I would use in place of honey? Anyone?? I tried this recipe last night. Following it just the way listed below. Added Chopped Black Walnuts and it was awesome. I make my own Almond Milk, so I dried out the Almonds used to make the Almond Milk. Dehydrated the blended Almonds, then grinded them into Almond Flour when dried. I used that Almond Flour to make them. All my hubby could say was yum! i made them and loved them and so do my boys! Looking forward to this being our new favorite! Thank you! Thank you! I have made it twice with subbing maple syrup for honey. Yum!!!!! Awesome brownies,only I used Xylitol and coconut sugar.. I'm in love with these brownies! I ate three lol! These are really good cake like brownies! I always do half honey half coconut sugar and the texture and flavor turn out perfect! They are really good kept in the freezer! I made these last night, and I'm happy with how they turned out! I used Blue Diamond almond flour and unsweetened baking cocoa. I pretty much followed the recipe, with a couple of minor tweaks: I used half honey and half coconut oil, and I baked for only 22 minutes instead of 25, based a suggestion above, to get a more fudgy texture. They are so moist and soft! They're not as sweet as the boxed brownies I'm used to, but I really enjoy the bittersweet chocolate flavor. I had everything on hand and didn't even have to pick anything up from the store to make these. Thanks for a simple, delicious healthier brownie recipe! I (under) used truvia instead of honey, coconut oil instead of butter and baked in a mini muffin pan for portion control. They made 20 mini brownies. Aaaaand I over baked them. They are dry and gritty and so not sweet at all. I'm playing around with almond flour and coconut flour recipes. It's going to take some getting used too since I love me some wheat flour baked goods! I'll try the recipe again with more truvia (for calorie reasons) and bake for less time, starting at 15 min instead of 20. These are the best brownies I have ever tasted!! This is the first gluten-free and sugar-free brownies that actually taste like out of the box.